While 2014's Boyhood brought Richard Linklater film's highest achievements with Oscar nominations, the director has been doing things his way for decades before. In 1994, he had no script, just two actors and the idea to have them walk around Vienna and discuss life. While it sounds like a boring and bland concept, it is anything but. Linklater brought on Ethan Hawke and Julie Delpy. 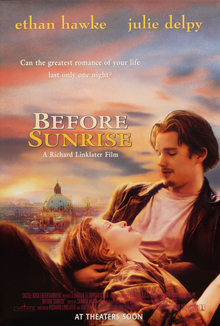 The story of Before Sunrise centers around Hawke, who is backpacking through Europe and meets Delpy's character on a train headed to Vienna. From there we see a romance blossom. The American tourist who thinks the glass is half empty and the French woman who thinks the glass is half full. They walk and talk and discover the city, themselves, and each other. What blossoms is one of the most natural romance films ever to grace the screen. The movies became such a cult hit that they spawned two sequels which we will be exploring in the next months (hint: those are the next two movies of the month).